Jim Brown, Jackie Robinson, Ferdinand Lewis Alcindor Jr. aka Kareem Abdul Jabbar, Mohammed Ali (formerly Cassius Clay) and Mark Stoddart. They are all visionaries and communicators in their own right. Mark Stoddart is a well known and respected artist in the Toronto community and there is quite a lot to be said about his talent (which will be covered in another post). His 25 years as a visual communicator has brought us many inspiring pieces in graphics, design and art. Dizzy Gillespie, Salome Bey, President Obama and Jimmy Hendrix are just a few who have been recreated on canvas through Mark’s perspective. Also, quite a few logos and album covers that you are most probably not aware of, in addition to thought-provoking projects such as The Live It, Wear It campaign, which looks to engage the community in supporting each other, putting your best foot forward and to live in your purpose. Mark’s latest addition to his immense portfolio, is an art collection with the above-mentioned athlete icons in Voices From The Past. 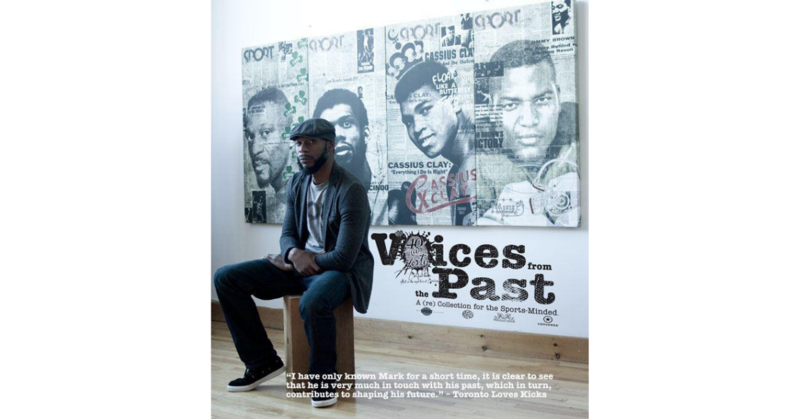 In conjunction with The SPORT Gallery, Voices From The Past is a gripping collection that transcends time. Celebrating SPORT Magazine’s 65th anniversary, the compelling black and white pieces are unique in the sense that Mark has chosen pictures rarely seen by the public. With the initial athlete pictures in the background, it is the SPORT magazine newspaper clippings in the foreground that make you stop in your tracks. You need to read and learn more. You become inquisitive and need to gain more insight into the story being told by the artist, through his work. And what a piece of work it is. Be sure to take in this wonderful exhibit. All sports lovers and art aficionados will truly enjoy it. Time is already ticking and November is right around the corner. Don’t miss out.